What would Warren Zevon have made of turning 72? The sardonic, acerbic, vulnerable and literate songwriter, born on January 24, 1947, died at the far-too-young age of 56 in 2003 of mesothelioma. 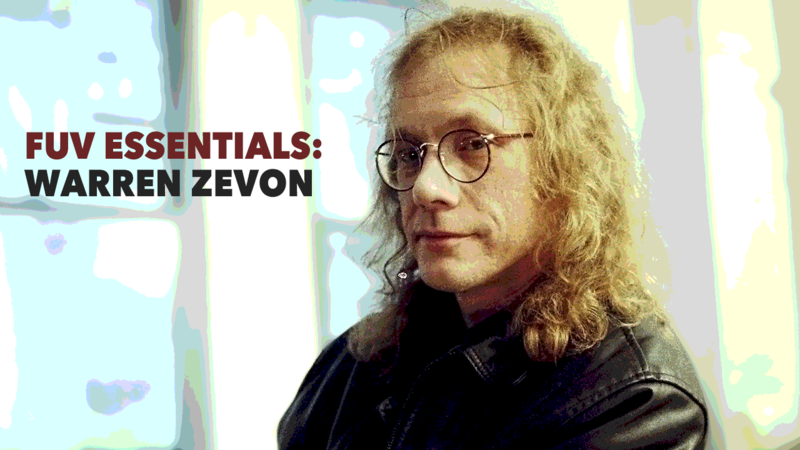 For his devoted fans and friends still mourning his passing, it would have been a gift to have Zevon's robust baritone dissecting the past 16 years. It's likely he would have railed against the fleshy indignities of aging; he was always predisposed to seeing the bleaker angles of most situations. The bombast and degredation of contemporary American politics would not have escaped his withering barbs either. But despite his darker inclinations, Zevon always had a sentimental grasp of humanity, even hope, slithering through the razor wire of his mordant lyrics. Never was his embrace of life's marvels more evident than when he faced a terminal diagnosis of cancer in August 2002. Over the next handful of months, as he recorded his elegiac final album, The Wind, and prepared to die, he also kept a very public diary of that exit. His candid conversations about his final journey, which ran the gamut from a VH-1 documentary, to a Rolling Stone interview, and an hour-long conversation with his longtime fan and friend, David Letterman ("Dave's been the best friend my music's ever had," Zevon said), were astonishing for their courage and his undefeated sense of humor. Zevon saw his last chance to make a significant album when he became ill. Rounding up friends like Bruce Springsteen, Jackson Browne, Tom Petty, Ry Cooder, Don Henley, Timothy B. Schmidt, Jorge Caldéron, and others to help him record what he so desperately needed to say, Zevon's The Wind was a cathartic goodbye for a man who always toyed, artistically and otherwise, with his mortality. "If you listened to his music," said Letterman on "The Late Show" when Zevon passed away on September 7, 2003, "here was a guy who just spit in the face of death." Zevon was lucky that he lived through his twenties and thirties. Ravaged by addictions to alcohol and drugs, he brutalized relationships in the ugly throes of that disease ("You did enjoy yourself to the point of punishing others," quipped Letterman to his friend in their last interview). It was often worse than that; Zevon was downright abusive to those he loved, as his ex-wife, Crystal Zevon, meticulously documented in her book about their marriage, 2007's I'll Sleep When I'm Dead. He finally took a breather from music in the Eighties to focus on his recovery. In fact, that "crackup and resurrection," as Rolling Stone described his harrowing escapades back in 1981, detailed more than one brush with death. Finally sober in 1986, his songwriting entered a different stage upon the release of 1987's Sentimental Hygiene, a clarity gleaned thereafter from eschewing booze for 17 years (a long sobriety that ended upon his cancer diagnosis), and ruthless self-examination. While the unruly"Werewolves of London," from 1978's Excitable Boy, was a surprising hit (with the bonus of Fleetwood Mac's rhythm section chugging along in the background), it's far from the best epitaph for Zevon. Even his other rowdy, caustic songs, like "Lawyers, Guns and Money," also off of Excitable Boy, or "Things to Do in Denver When You're Dead," found on 1991's Mr. Bad Example, fall short of representing the full scope of Zevon's songwriting. Traveling through his 12 solo albums, navigating the rolling thunder of his self-described "excess and chaos," it's the deeper album cuts that stick, revealing his instinct for complex character studies, his pain, and a disarming tenderness. For listeners digging into Zevon's discography for the first time, it's the more pensive or quieter gems that captivate, songs like "Mutineer," "Desperados Under the Eaves," "Don't Let Us Get Sick," "Boom Boom Mancini," "Genius," "Mama Couldn't Be Persuaded," or "Reconsider Me." The son of a Mormon mother and a Russian-Jewish father who was a gambler ("a prototypical gangster," as Zevon told Rolling Stone's David Fricke in their 2002 chat), Zevon was a classically-trained pianist who knew the composer Igor Stravinsky as a teenager. Zevon certainly didn't have a storied start to his career—his spotty 1969 debut album, Wanted Dead or Alive, was very dead on arrival (but its title became an eerie augury of his obsessive wrangling with mortality). He wrote for others, like the Turtles and advertisers searching for jingles, gigged with the Everly Brothers, and befriended just about every musician who mattered in Los Angeles: Browne, Linda Ronstadt, Stevie Nicks and Lindsey Buckingham (his former roommates), Mick Fleetwood, John McVie, Bonnie Raitt, Carl Wilson, J.D. Souther, Glenn Frey and others. Most of them landed on Zevon's second eponymous album, produced by Browne and released in 1976 on Asylum Records. Despite the respect he earned from his contemporaries, like Springsteen and Bob Dylan, significant commercial success always eluded Zevon. His terrible struggle with alcoholism certainly derailed him, but he always remained on the periphery of the inner circle of mainstream success, aside from a tiny handful of singles rotated on classic rock formats. Like Townes Van Zandt, he was more of a cult figure, a songwriter with devoted acolytes who perhaps saw their own uncomfortable selves lurking in the lines of Zevon's anguished, tumultuous lyrics. In an ironic coda to Zevon's tales of frustration, he was posthumously nominated for five 2004 Grammy awards for The Wind, winning two for Contemporary Folk Album and Rock Performance by a Duo or Group for "Disorder in the House" with Springsteen. But he did live long enough to meet his twin grandsons, born to his daughter Ariel in the months before he died. "From your perspective now," Letterman queried his old friend in October 2002, "did you know something about life and death that maybe I don't know?" Zevon paused for a long beat. "Not unless I know how much you're supposed to enjoy every sandwich," he famously and ruefully replied. And I will be right next to you"
For his uncanny way with words, rambunctious wit, roller coaster rock 'n' roll intensity, complicated legacy, and the transformative way he finally taught himself—and everyone who ever loved him or his music—about the ephemeral magic of life, Warren Zevon is an FUV Essentials artist.